If you're looking for a low-maintenance fitness tracker to simply help you count your daily steps as part of your personal fitness goals in 2018, it's probably difficult to justify shelling out for some of the fancier options out there today. The Garmin vivofit 3 is far from fancy, but it offers great battery life and can track your steps and sleep patterns. Amazon is selling it for just $41.49 today as part of its Deal of the Day. Maybe the most appealing feature of Garmin's third-generation vivofit fitness tracker is its promised one year of battery life (it has a user-replaceable lithium coin battery). Other than that, the water-resistant vivofit 3 can track your steps, distance traveled, and calories burned. It can also set personalized daily step goals based on your activity levels. When you're not on the move, the device can tell you the time and date on its 0.39" x 0.39" always-on display and monitor your sleep patterns. If you've been inactive for an hour, the vivofit 3 will show a red "move bar" and sound an alert to let you know that it notices your sluggish ways. The move bar grows every 15 minutes until you get some steps in, which can be a motivating source of mild anxiety. Amazon is selling the regular fit version in black or white, and the extra large version in black. The $41.49 price reflects a 48% discount and an all-time low, according to CamelCamelCamel. 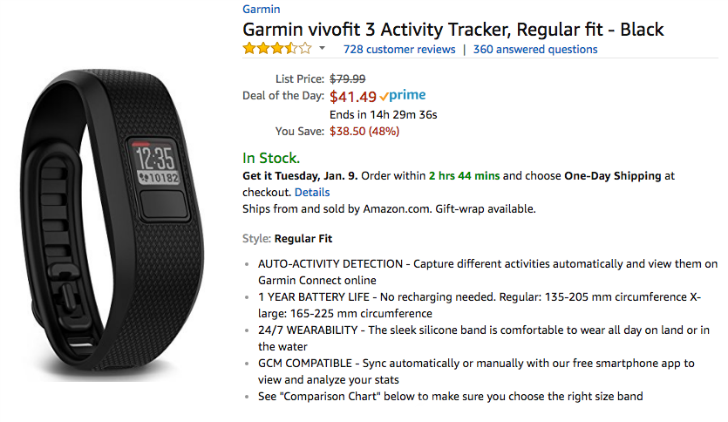 If you're looking for a slightly upgraded option, the Garmin vivosmart 3 is also part of this Amazon deal. It's going for $72.49, which is also a 48% discount ($67.50 off) and an all-time low. This tracker features a heart rate sensor, barometric altimeter to track steps climbed, and an OLED screen. It can also display some notifications from your phone. These are solid deals if you're looking for a straightforward tracker on the cheap. Since this is a Deal of the Day, time to act is limited. At the time of publishing, there are fewer than 15 hours remaining.